I think it must have been about 1970 that these two guys came to give a talk at St Andrews University where I was a student. They were from an organisation called "The Scottish Minorities Group" and I think they were giving a talk about homosexual peoples' rights. I don't think it would have been gay rights because I don't think the word "gay" was really used back then. i was 20 years old and it was the first time I'd met out gay men. The gay men I'd met up to that point - and especially the two gay men who wanted to have an affair with me - were both firmly in the closet. I loved one of them very much but i was so terrified of my identity and my sexuality that I could not really act on my feelings at all and he was so ashamed of being gay and so worried about losing his job if he was found out that our relationship never came to anything. You have to remember that at that time our relationship was against the law. And if we so much as held hands we would be arousing suspicion. I wanted to hold hands. The fact I couldn't so hurt me. And it all added to the trauma I was suffering because I was trans. Though I couldn't really define myself as that because the word didn't exist. What I was was unspeakable. And there i was at that meeting and those two guys made a very deep impression on me. Because they weren't making a big thing of it, really, they were just who they were and somehow they seemed to know they were OK. It was years and years before I actually came across a single person that was trans - and they were so unhappy and bitter and miserable, poor loves, that they put me off transitioning for ages. And every time I talk in public or perform in public or am generally out in public I think of them and hope that I'm doing perhaps as much good to the people I meet as those two brave men did for me. I got asked to moderate, or chair, the launch event for this book and I almost didn't do it. One of the hazards of being a survivor of prolonged and profound childhood abuse is that you tend to assume you can't do things and I didn't think I really be able to do this. But then the book is about people who came out in the public and political sphere and the effect this has had on society and it interested me and I try not to listen to the voices who tell me I can't do things and anyway I'm not very good at saying no so I agreed. And I'm so glad I did because on Wednesday night I found myself sharing a stage with the most amazing people. Louisa Wall, who spoke about the moment she made marriage equality happen in New Zealand; Sunil Babu Pant, who spoke about being the first openly gay MP in Asia in 2008 and his success in having a 'third gender' identity option recognised for Nepali passports; Chris Smith who spoke about the moment he became the first British MP to come out; Hannah Bardell, the SNP MP in the present Westminster parliament speaking about coming out in that vile public school boy institution; Marco Biagi, former SNP MSP, speaking about the moment he steered the equal marriage law through the Scottish parliament; and Sarah McBride, the first trans woman to speak at a national party convention in USA. She was charismatic, eloquent, amazing... so profoundly moving to share a platform with her. Her presence such a measure, such a powerful reminder of how far things have moved forward. 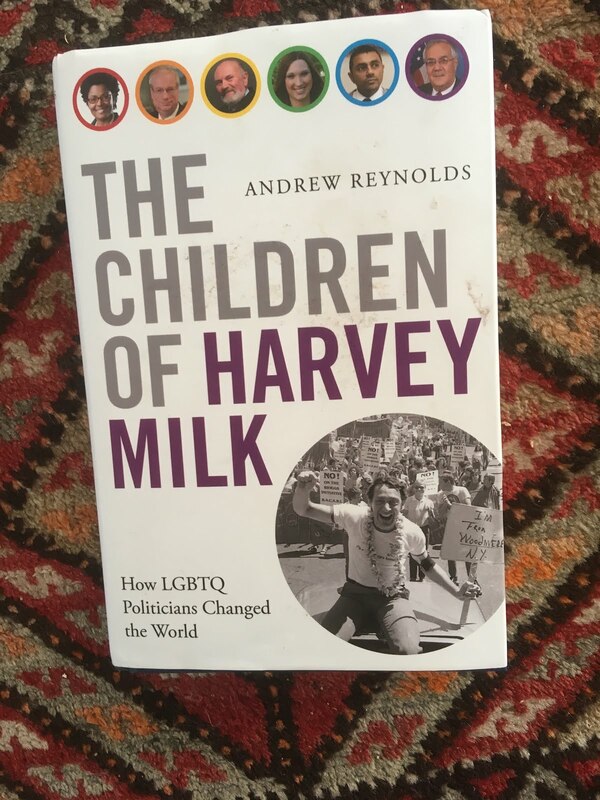 And all in the presence of the lovely Andrew Reynolds and his beautiful, inspiring book. A real privilege and joy to be there at the Scottish launch of it: to welcome its appearance and bless it on its journey through the world. I think we all felt it in that room that night: the power of coming out, the power of being true to yourself, whatever your sexuality or gender, and the bright light that shines in a dark world. And then last night was the beginning of rehearsals for THE GOSPEL ACCORDING TO JESUS QUEEN OF HEAVEN. Another joy. Another powerful reminder. Queen Jesus says: "We all have a light inside us, and sometimes it's the very thing we've been taught to be most ashamed of. And if you have a light, go you hide it in a closet? No, you bring it out into the open where everyone can see it. And be glad it exists to shine in the world....."